Before the weekend arrives, there's just time to inform you about a festival of pure might that's taking place at Manchester's Deaf Institute on May 2. 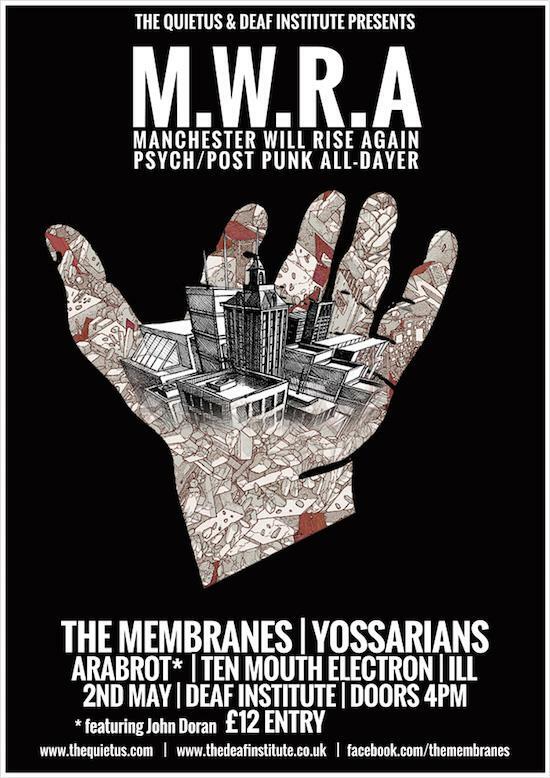 Manchester Will Rise Again celebrates the city's psych and post-punk music, and, as such, it's only fitting that heading up the bill will be post-punk bigwigs The Membranes, airing their new album Dark Matter/Dark Energy ("punk psych trip that explains the life, the universe, death and existence itself. In less than 90 minutes. With power chords"). They'll be joined by dark psychedelic troupe Yossarians, as well as Ten Mouth Electron, frequenters of these pages and contributors to the Minor Characters project, and Ill.
Alongside that fine lot will be longstanding tQ favourites Årabrot, uniting with the Quietus' co-editor John Doran to perform a mix of "chaotic industrial psychedelia" and spoken word, with John reading passages from his upcoming book, Jolly Lad, due out on Strange Attractor Press in May. The sections in question will be "covering the themes of the haunted bus routes of Manchester, the art of self-tattooing, the death of Margaret Thatcher and the ritual slaughter of Dapper Laughs". Aiding and abetting John and Årabrot's Kjetil Nernes in the musical side of their endeavours will be local performance artist Louise Woodcock, Neil Francis, of GNOD and Terminal Cheesecake, and Jay Tea of Locean and Ten Mouth Electron. For further details, head to the Facebook event and buy tickets here.